Have you ever dreamt about losing teeth? I mean, really losing teeth?! After beginning my graduate degree in 2014, my dreams shifted. I started to experience nightmares around midterms and finals. This change started my first semester in graduate school and instead of teeth falling out, my nightmares focused on military service. I am not surprised. I was working full-time with active duty personnel, veterans, and their family members while studying issues tied to military and veteran communities. The last nightmare I recall occurred after graduating last spring. When I am particularly stressed though I still dream about being back in the Marine Corps. Last night I had one of those dreams. It wasn’t complicated or anything. I knew I was back in Iraq and I was showing a fellow Marine how to inspect her gas mask. The only “conversation” I remember is reminding her (like you have to do with people in general) that the gas mask carrier is not to meant to store other things (extra rounds, food, etc.). It may sound silly but people will do it. In the dream I was stressed knowing my daughter was missing me; she’s never been away from me for very long and it was difficult to know my departure caused her grief. My musical tastes are somewhat sporadic and typically I’ll listen to some country, pop, and rock throughout the day. I’ll jump from country to pop to rock depending on what I’m feeling with the songs. If I need to calm down I’ll find some good country songs. When I need some energy I’ll listen to pop songs and when I need to feel like I can accomplish anything, I definitely listen to rock. Haha. I know the likely source of my current stress is upcoming fireworks, namely consumer use of fireworks. Starting on June 24th, my fellow neighbors are permitted to use fireworks and can use them until July 6th, and I know from past experience plenty will use the illegal mortar tubes ones. The $1,000 possible fines are not enough of a deterrent to keep people from using them. The good news is I have another coping tool in my toolbox this year. While I cannot determine when my neighbors will use fireworks, I now know when permitted public fireworks displays will occur in my local area. I didn’t know this notification was possible until I was startled by a public display in late May and reached out to the Town of Gilbert’s Fire Department on the matter. From there, I was connected with the main fireworks company so I could get on their notification list and the Fire Department notifies me when other companies have fireworks displays around my home. I would encourage other veterans who experience anxiety and panic attacks as a result of fireworks displays to see if their municipality also offers a similar service. Fingers crossed I don’t have any more chest pains tonight or dreams about being back in the Corps. That’s all I need for a good Friday night. Last week, I heard back from the VA. Yet again, they don’t consider my chest pains to be service-connected. This reality kind of floored me. I actually opened up to them in my December 2016 claim and while it might sound silly to say such a thing, in 2007, I kept things simple. I didn’t tell them about Captain Brock dying. I didn’t tell them about my kind of work. I didn’t emphasize my exposure to mortars, although that information was part of what I listed in my records about different types of exposures while in the Marine Corps. Back then, I was dealing with chest pains and I knew I didn’t have them before I served. They started at the tail end of my first deployment, continued after I returned, and remained a part of my life through separation. I just needed the VA to understand at my point of separation the chest pains were still ongoing and I felt they were related to my service in Iraq in OIF 2-2. If I had realized what a miserable experience it is dealing with the VA on the disability compensation side of the house, I think I would have pushed harder to find the right medical support while I was in. For the few times I was willing to subject myself to medical about this condition, every person wrote ‘non cardiac origin’ for the pains but no one wrote in a diagnosis or suggested getting additional feedback on my situation. What’s more infuriating is the parts where it reads ‘exercise induced stitch.’ Seriously, in the twelve years I’ve dealt with these pains only the primary care provider I’ve dealt with most recently has delved further into this issue and offered different suggestions because the pains were getting to the point they were destroying my quality of life during waking hours and would interrupt my sleep. For over a year now I’ve wanted to have a conversation with you all about the Pre-and Post-Deployment Health Assessments and I think with this other VA encounter, I have the right foundation for this discussion. The VA does not know our deployments the way we do and part of the problem is also the way the system requires ticking off boxes, ineffectually asking and not asking the right questions. The forms we complete do not necessarily represent the types of situations we may encounter; let’s be honest here, the VA will never have records from the Marine Corps and/or the US government that 175 United States service members died during my deployment and these numbers best represent the information I was feed every day as part of my work in our operations center. I only know this information because I was determined to find a way to discuss my deployment, to shed light on other aspects of war no one seems to look closely at but is an important job all the same. I am only privileged to know this much of the extent of my deployment thanks to Military Times data. In cases like mine my work was classified secret so how was I suppose to honestly fill out the forms? As well, even if I could be honest, there also is not a sense of privacy to complete the forms properly not that I would have trusted completely it in full disclosure. On my first deployment, I was the only woman on my team so I felt implied pressure to not be the “weak link” and during the second deployment a lot of stress from the first deployment crept up that I was not willing to discuss with my command. Nor was my situation helped by the fact my chest pains occurred on deployment and yet again, no real resolution came out of getting them checked out. My apologies I currently do not have snapshots of my first deployment paperwork. eBenefits is being quite a disappointment and again not allowing me access to my military records. The next time it’s available, I’ll try to download all my copies so I can share those details with you. For now though, we can press forward using information from my second deployment documentation, the pre-and post-deployment health assessments. It’s kind of funny I still had my maiden name on my pre-deployment health assessment. I was already married by then. I’ve cut off segments of the documentation as my copies contain my Social Security Number but for greater clarity on this issue, below are fuller snapshots of the pre-deployment health assessment form that existed during my period of service. The revamp of the Post-Deployment Health Assessment is also of great concern to me, and I think all veterans of this era should consider how the inadequacies of the earlier form shape what sort of service/deployment experience is considered valuable, dangerous, and potentially traumatic. The forum in which service members were offered to complete their forms is equally as important. I can remember completing the first form in a classroom with a number of guys, classroom style as though we were taking an examination for a grade. It was really a matter of “everyone’s got to do it”. You fill out your form by hand and turn it back in. You don’t want to get called out for your answers and you just want to make it back home. My chest pains are the only thing I shared with the VA as a serious issue in 2007 and again, I am making the choice to share so much personal information because I don’t necessarily see our system getting better if there is a significant gap between what people expect their service to be like and the reality of the experience. I hope by cracking open an issue like poorly constructed pre-and post-deployment health assessments provides a lenses for organizations like the VA to understand where they must also take a step back and learn from veterans what deployments are like. I also hope current service members look at their needs before the needs of the organization they serve; at some point, we all leave the service and our personal health cannot take a back seat because we didn’t want to look like malingers/didn’t want to lose camaraderie/didn’t want to let down the team when a medical issue should have prevented us from deploying. When I also decided to share with the VA this go around the fact I’ve dealt with tinnitus in the last few years and for a shorter duration, moments of hearing loss, I expected to have them listen. I thought it was fairly reasonable to be ‘heard’ since I have recorded mortar exposure in my records but never sought treatment because I didn’t notice anything wrong at the time. I will continue my saga with the VA another day. Yesterday, I volunteered with a handful of other veterans to be part of a local community collaboration sharing our stories interwoven with pieces of The Odyssey for Odyssey Home: A Veteran Performance. The Chandler Public Library held this event called Creating Peace From Conflict at the Chandler Center For the Arts in partnership with Arizona State University and Veterans For Peace. We also had Veteran Vision Project photos on site for attendance goers to see along with the individual narratives associated with each photograph. Once the footage is available, I’ll provide the link. This collaboration starting off with group drumming and continued with our storytelling mixed with selections from The Odyssey. A few musical pieces were played by Guitars for Vets and another veteran, Ahmad Daniels was there as a representative for Veterans For Peace, also sharing his story. I know the event was scheduled to conclude with audience engagement, sort of a Q&A opportunity. I only stayed for the Odyssey performance as I had another engagement in the afternoon and with today being my daughter’s birthday, I wanted to make headway Saturday on some other issues I’ve currently slacked on. The theme of the performance was homecoming and I am quite thankful the event started with the group drumming. While I did not choose to drum (I am embarrassed by my lack of rhythm) the sounds that filled the room reminded me of the wonderful performance given by citizens of Sao Vicente when I visited Cape Verde in high school. My peers, teachers, and I landed to a beautiful musical performance at the airport that reminds me still music is a thread shared globally; we may not always understand each other’s words and actions but music binds us in such a spiritual way. I loved being reminded of a place that was my home for a short period of my life. Three weeks may not be an eternity but it’s sufficient time to be welcomed as a stranger, treated like a daughter, and remembered as a friend. I am forever grateful for that experience and everyone who welcomed us into their country, their homes, and let us savor their culture that we might never have experienced in our lives had our paths not crossed. I think I was better able to embrace my role as a participant yesterday feeling like I was welcomed to this group much like how I was welcomed into Cape Verdean life. My cohort of veterans included an ASU professor, my close friend and fellow ASU student, and a future student. For our individual tales, we provided the audience a better glimpse of ‘homecoming’ as experiences shaped by individual perception and built a bridge that homecoming is not exactly a single finite moment in time, but a process. I focused on the more immediate aspects of coming home to family tragedies and feeling like I did not fit into my life stateside. I think a vital part of the construction of this storytelling was how well Robin Rio and her students shaped the music performance. I met Robin back in the fall of 2014 when I started my graduate degree at ASU. She is an Associate Professor with the School of Music and the Director of ASU’s Music Therapy Clinic. I interviewed her to gain a better understanding of ASU’s chapter of Guitars for Vets. This talented bunch just wow me; there’s so much musical talent in this group. I cannot wait to share the performance so you can understand how beautifully they play. I know it’s not normal for you to get an updated post from me this time of time but I am at home with my sick daughter and now that I’ve sent her off for an afternoon nap, it’s time for me to enjoy some “me time” which translates to writing. It may not be what I do best [yet in my life] but it’s one of the best things I enjoy. When I started this blog back in 2014, I mentioned something that probably did not come off as an intimate detail in my life. I mentioned how, back in 2004, one of the Corporals at my unit told me not to write a book about Iraq. Now, as a thirty-two year old, I cringe more when I think of that asinine statement. There is not a single soul in this world that deserves to tell me what to do with my life. I think war narratives are important, even if I haven’t liked all the ones I’ve read. The point is not to get rich. The point is not to be famous. The point is to convey a slice of history that can be lost otherwise. The point is to capture sights, sounds, people, and places that are changed in the moment and hopefully influence people to take a more nuanced approach to understanding war. As impossible as it is to whittle down what I learned in graduate school, one of the best lessons I came away with is uncovering the extent of how society ignores, belittles, and underreports the achievements and lived experiences of women. We are not shadows of living beings; we are living, too. I say society in this reference in speaking specifically to American society however there are many teachings that shows us women compared to men are often given less notice. I write to you all today to tell you I will write my book. I will write it regardless of whether it gets published. I will write it because there will never be another moment in time that mirrors this experience. I will write it because there are numerous others who could gain something from this type of storytelling. I will write because a song I heard recently made me think of this experience and the amount of emotional connection I have to that point in my life. I will not forgo a personal achievement because another human being has such set opinions against writing war memoirs. I write because I cannot remember everything. I write because I want to remember special moments. I write because I want to remember people, good and bad. I write because history changes so quickly. Not everything I write is important to share publicly and many things that occurred privately have not been discussed in an open forum. I write because I want–need–some peace in my life. Writing is my escape from people, places, things I cannot change. When I was younger, I struggled to cope with the loss of my mother and Bart’s murder. Their absence from my life completely changed my life trajectory. I chose to leave Rhode Island and then I made a life changing decision to become a Marine. This decision had more than a temporary effect on my life, one that persists today. I catch myself being caught off guard by my emotions as I start writing small stories to share in my planned book. My interpretation of certain events is just that, mine. For this reason, I am intentionally seeking people’s permission to share my view of our shared life experiences. So many things/people/experiences will be intentionally excluded which lends a certain perspective to my story as does the inclusion of other details. My emotional responses then and now as I construct these drafts remind me I love and enjoy storytelling. I’m on guard–for the most part–in my public life. I have certain responsibilities and obligations in my daily life to fulfill that require a certain demeanor. My temper must be subdued. I can’t call people out for their inappropriate behavior, even when they act like petulant children. When I’m comfortable in the presence of guys, this ease–as my Marine Corps experiences have taught me–is often misinterpreted. Our mainstream American culture, and its notions of heterosexual relations, sees closeness between men and women as heavily influenced by sexual intimacy and not always trust, personality compatibility, and interested in shared goals. A huge area of concern for me, in my writing, is the fact I have so few examples of female leadership. My spring studies taught me this is not inconvenient data, using some verbiage from my instructor, Dr. Weitz. Unfortunately, I don’t enjoy talking about some of the women I’ve met in my life. So often, I’ve felt awkward in the company of women. Some are either too feminine, some are my competitors, and others are there asking for someone else to take care of them for their lifetimes. Hence my struggle to adequately discuss women when I have such a biased opinion against people of my own gender. I wish I could write about women as easily as I could (and can) write about the men in my life. 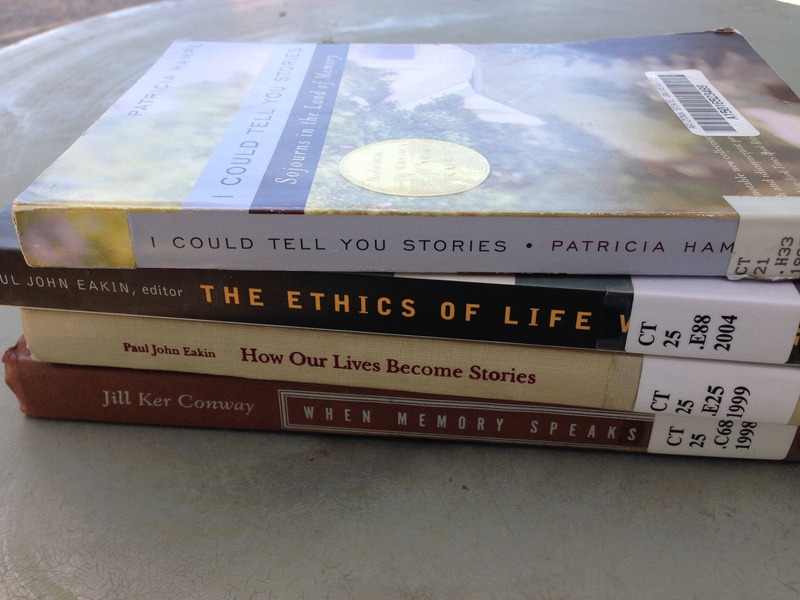 Taking on some serious homework to learn about the ethics of memory writing, per the advice from my professor.